Runners, please review and acknowledge here that what I have you listed for matches what you think you’re doing. Drivers, please post here that you’re still in and you understand what I’m asking from you. Also, drivers, the Mass Pike is an electronic toll only road, please confirm you have an EZ-Pass (or whatever they call it these days). If not we’ll have some thinking to do. Let the planning for the 2017 Hopkinton to Boston College Training Run begin! The run is this Sunday, March 26th, meeting at Brueggers at 6:45AM, leaving promptly at 7AM, arriving in Hopkinton around 8AM, finishing in Boston between 11AM and 1PM. We have 41 people in for the trip, 31 of them running! There are 8 dedicated drivers and 3 pairs of half distance runners. Tonight I will create and post the plan for the run. Any changes after this will be highly frowned upon. If you know anyone that thinks they’re running/coming and you don’t see their name below, please reach out to them and tell them this is the last call. Tomorrow look here for the SLR Road Trip Plan. The general concept is several cars drive all the runners to Hopkinton. We stop at gas stations right off the highway before starting to run. We meet at the start line, take a quick picture, and start the run. One volunteer will support the lead pack, one supports the trail pack, the others leap frog from stop to stop to support the entire run. One car will collect all the post-run parents and head to the finish ahead of all the runners. Runners can walk over to Dunkin Donuts, to change. I also hear that some people have used the BC gym to change, but I’m not sure how that works. In the past there was a finish picture at Boston College but lately the runs have been cold and the lead runners will not be asked to wait for the trail runners. We will be heading to the Melrose KofC upstairs bar at about 1PM for a Taper Time Pasta Party with food from Comella’s . I’ll collect $10 per person to cover the cost of food. Beverages will be available at the bar. I count 25 people interested. If you are interested in attending and don’t see an * next to your name, let me know. We had an easy winter, until we got close to spring. With freezing temperatures, frozen packed snow, and cold winds, the past few weeks have been a test of your fortitude, toughening you up for the challenges coming on race day. Keep you chin up and keep marching forward. Thanks to Lois, Hank and Kenny for getting you through last week. This week, while the St Patrick’s Day Parade marches through Southie, we’ll be parading around Swains Pond and then the long run will take you to Wakefield. Due to snow and ice I’ve altered the long route slightly to avoid Breakheart. Here is an updated map. The Route: We’ll start out together running up East Foster to Melrose Common, turning right on 6th Street. This will turn into Swain’s Pond Ave, bringing you to a quiet wooded section of Melrose. When you reach the ponds you’ll come to a stop sign, turn right here to continue on Swain’s Pond Ave. Swain’s Pond Ave will bring you to Lebanon Street where you’ll turn right. Head to a set of lights and turn left on Forest Street, bringing you past Oak Grove Cemetery and over to Main Street in Malden. Water Stop 1 will be in the parking lot of the Citizens Bank when you get to Main Street. Leaving this water stop through the other end of this parking lot will put you on (the aptly named) Winter Street. Take Winter past the Oak Grove T Stop to a 5 way intersection. Go straight through the intersection on to Glenwood St. Follow this windy hilly road to Highland Ave where you’ll take a right into the traffic circle at the Fellsway East. Take a quick right here to get on to the Fellsway East and follow it past Grimsby’s to the LynnFells Parkway. Look for a water stop at the knoll across from Melrose High School. After this stop, continue on the LynnFells Parkway to Saugus. Turn left at Main Street in Saugus. If you’re running short you’ll take the familiar left turn on Howard, run down to a left on Green Street which will merge with Main Street in Melrose to finish you’re 11 mile run. The long runners will not turn on Howard, they’ll continue on Main Street as it turns into Farm Street in Wakefield. There will be a water stop waiting for you at Wakefield Middle School. After the Middle School water stop you’ll continue on Farm to Water Street where you’ll turn left. This will bring you to Main Street in Wakefield at Wakefield Center. Turn left on Main and follow it back to Melrose. You’ll take a turn onto LynnFells Parkway to pass back past Melrose High School where you’ll again find the water stop at the knoll. After this water stop scoot along the LynnFells Parkway to Grimsby’s where you’ll turn left on West Wyoming. Make your way to Main Street and turn left to get back to Brueggers. Water Stops: A combo of me, Tom and Hank will take care of you this week. Next Week: I need volunteers to drive to Hopkinton and support water stops next week. If you or someone you know is willing to spend their morning driving and supporting, is good at following directions (both map wise and command wise) I need their help. Usually we need 6-8 cars. This year I’m expecting a huge turnout as the SLR has been quite popular this season. Please let me know if you can support next week and how many passengers your car can fit. 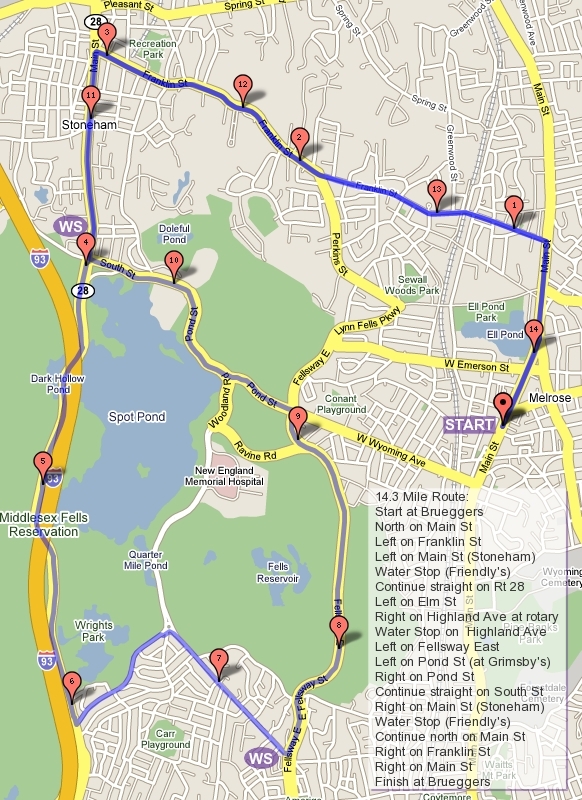 If you want to run the short route next week, consider volunteering to drive half the route. I’ll pair you up with another short route runner and one will run the first half of the run while the other supports water stops and in the middle you’ll switch. It’s a fun day. I’ll be posting info about daily over the next week, so keep your eye on the blog! Last week’s weekend weather was a dramatic change from the warm weekday weather. With strong winds and freezing temperatures, the long 10 and 20 mile runs were more of a test of endurance than they typically are. The group was smaller than usual due to tunning on a Saturday, but about 30 runners braved he cold to complete their training runs. This week the weather warmed back up however to continue to challenge you it has cooled back down as snow passes south of us. This weeks run is a recovery run, stepping back to 16 miles for marathoners and 8 for half marathoners. we’ll start out running north on Main Street to Wakefield and a water stop at Nick’s. From there you’ll continue up Main Street to Lake Quanapowitt. If you’re running short turn left at Church Street and left at North Ave to get back to the water stop at Nick’s. From there you’ll hear south on Main Street back to Brueggers. If you’re running long, loop the lake counterclockwise bit stay on North Ave to return to the water stop at Nick’s. after that water stop you’ll head out on Nahant over to Wakefield High School. Run up the hill to the Voc and enter Breakheart on the Wakefield side. Run a full loop counterclockwise, popping back out at the Voc. Run back down the hill, across Nahant, and back to Nicks. After this trip to Nicks you’ll head back to Melrose along Main Street to finish up at Brueggers. Water Stops: I won’t be here this week so our good friend Lois will be coordinating the run this week. With Help from Hank she’ll take care of the one and only stop on this long run at Nicks. For those who missed 20 miles last week and are looking to make up their 20, let us know and we’ll work out a bonus stop near Brueggers. For those who chose to run their 20 miles at the Black Cat instead: Good Luck!